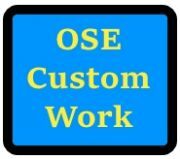 This is used when OSE does custom work for an order. But 1 item for each dollar needed for labor/work. For example. If something will cost $20.00, buy 20 of these. Shipping fee's are applicable with this item. Please do not use this unless you speak to us first about the costs.